When you sit for Black Belt you will be required to prove to your examiner that you have developed sound technique with good speed, power and accuracy. All through your various coloured belt gradings you are asked to display a growing level of technical proficiency but the Black Belt grading requires you to demonstrate an “understanding” of that technique. At a Black Belt grading you must prove to the examiner that you are not an “imposter” with regard to your self defence ability by demonstrating that your kicks and punches are effective tools of defence should you ever be required to defend yourself or others. In class and at grading our training partner is just that a partner, we can’t be breaking their ribs just to prove to the examiner that our technique is worthy of a Black Belt promotion. We therefore need to show our ability in some other way and this is why we are asked to break boards. There is nothing wrong with breaking boards; it is usually quite safe to do so if you carefully follow the instructions of your instructors. Tips for Shim Jang Taekwondo Board Breaking Success ! 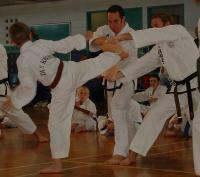 • Kick or punch THROUGH the board; aim for a spot that is PAST the board and take advantage of your speed. • Don't stop or slow down as you hit the board; if you do it will hurt and, more often than not, you will not be successful at breaking the board. • Practice; you can use re-breakable plastic boards to practice board breaking at home, or pick a spot on the fence as a target to practice your accuracy and control. • Work on your accuracy; Don’t break boards until you are confident with your accuracy, you can injure your hand or foot (and the hand of the person holding the board) if you miss the center of the board. • Speed and accuracy are your friends; you don't need overwhelming power if you hit the board in the correct place with fast technique, practice with the heavy bag or a strike shield. • Hone your technique; without correct technique speed accuracy and power amount to little, work with your instructor to develop your best technique then………SMASH THEM BOARDS !